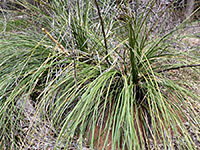 Like all members of this genus, nolina microcarpa is characterized by a dense, stemless rosette of long, narrow, flexible leaves, rather untidy in appearance. Each clump may be 6 feet in diameter, and form clusters, propagation being by underground shoots. Leaves are relatively thick, have a rough surface, and are between 1/4 and 1/2 inch across and up to 50 inches long. They are lined by rows of small, closely spaced teeth. The plant has quite a wide range, from the vicinity of Kingman in northwest Arizona, across the central and south eastern parts of the state, into the grasslands of southwest New Mexico.